Don't waste time or energy on bags designed for other sports - keep your gear dry, organized, and in ultimate style. 452 backers pledged $93,282 to help bring this project to life. To show our gratitude for the amazing outpouring of support we've received, we're introducing some stretch goals to help make this Greatest Bag even greater than we ever imagined! As each stretch goal is reached, we'll have the funding to add extra color choices and even a wicked shoulder strap, on all bags, and with no change in the reward tier commitment amounts! Thanks, backers! Is your ultimate bag a big dark hole with all your gear just dumped in? Or some mix of plastic shopping bags and your high school backpack? Sick of the messiness, the time spent digging around for your keys, or the smell of sweaty socks when you raise your water bottle for a drink? Then call a time out on struggling to get your gear to the field. With it's unique, custom-designed organization system, the Greatest Bag is going to be the MVP of your next tournament. Stop rain and dirt cold with this water resistant, TPU coated, 900D ripstop ballistic nylon. Break out the padded backpack straps with hip belt for comfortable support when you're on the move, tuck them away and convert to a sleek duffel for easy sideline access. the backpack straps' ergonomics have been improved for even comfier carrying. a shoulder strap!! We are excited to add this most requested feature! Keep your smelly socks and wet clothes away from other gear in the ventilated compartment. Use the dual zipper system to either seal them off or air them out, depending on whether you want friends or personal space. A place for everything and everything in its place - a hard case that can fit sunglasses and your smart phone, and pockets to keep sharpies, snacks, gels, keys, wallet, battery pack, earbuds, and all your other accessories organized and easy to find. The insulated Cooler Compartment keeps your drinks frosty cold, and is a great place to store your Greatest Ice Bag (a US$9.95 value, included FREE with every Greatest Bag) when you're not using it to ice injuries or cool off. Update: Added thermal-insulation foam on both side of the Cooler Compartment, to keep your drinks and Ice Bag cooler longer. Your cleats are dirty and smell like feet, but there's no need to carry them in a separate bag. This dedicated Cleats Compartment is roomy enough to fit up to two stinky pairs. Show off your disc swag on the outside of your bag! Use the adjustable bungee straps to hold up to two discs, save internal storage space and prevent tacoing, at least until you break out that bladey forehand you've been working on. Our water resistant fabric works great but when heavy rains hit, break out the snazzy, easy to get at rain fly for extra protection in a hurry. Throw your clean clothes, foam roller, sleeping bag and onesies in here. New feature:the hip belt pockets have been enlarged to fit more mobile phones, and now come with RFID-blocking material, to protect your credit card and passport info. New feature: a carabiner loop for hanging your water bottle or other accessories - with a free carabiner included! With this many features, the only limit is your creativity! Damp field? Sit on the backpack flap, or use it as shade from the rain or sun. More? Basketball, Field Hockey, Cycling...Let us know the great ways you find to use your Greatest Bag! The Greatest Bag can be yours in six color schemes: Gloss Black or Matte Blue ripstop material with Bright Red, Neon Green, or Neon Blue high-lights. Included in the Butterfingers and The MVP Reward tiers are custom printed Friction Gloves (a pair) featuring the Greatest layout logo. Less sting from zippy throws; Catch and sky with more confidence! 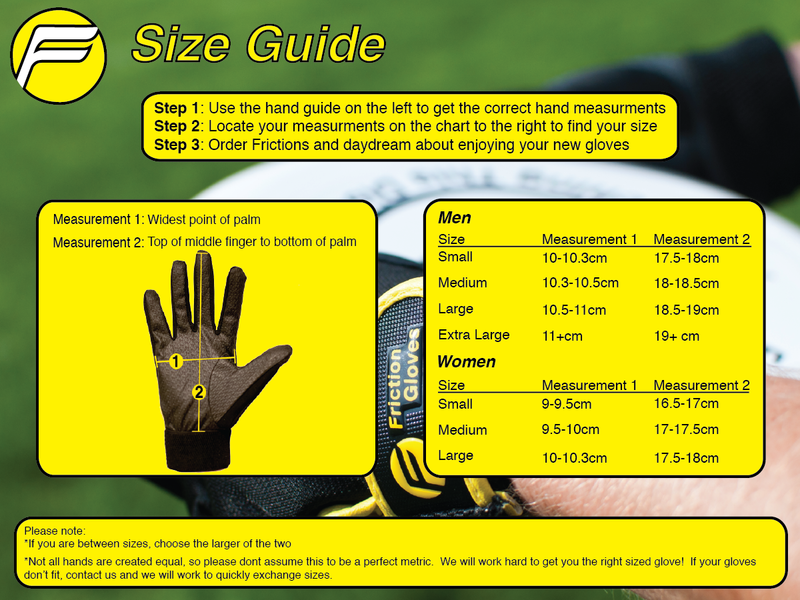 Please click here for sizing info. Chris Hancock (left) is not only a Portland Stag, he's also the man behind Friction Gloves. We're proud to partner with the #1 selling ultimate gloves in the world! The Greatest Bag has been (painfully) field tested at Potlatch, on the road in Japan, and as part of the official kit for Team Hong Kong at this year's WUGC. We stand by the quality and materials that go in to our products. Each bag comes with our lifetime manufacturer’s guarantee against any defects in materials or workmanship. Our warranty does not cover damage caused by negligence, improper care, or accidents. If damages are not covered under warranty, we may help to recommend repair services. The warranty also doesn't cover dirt and scuff marks. This is ultimate, not badminton. Thank you, ultimate community, for being so open and generous to four crazy people chasing a dream. Extra thanks to all of our close friends and family who supported us along the way. We couldn't have made the Greatest Bag a reality without you! Also, special shout outs to Holly and the rest of Team Hong Kong; zen & zany productions; all of our talented video "actors" (like the guys above pretending to be amused by Dave's story); Gray Dude Photography; and the ultimate pros and media who have shared their feedback and love of the bag! When we're not playing ultimate, we work in sourcing and manufacturing. We've already found and qualified the supplier, gotten samples and put those samples through their paces at Worlds, Potlatch and in the pro leagues. This experience and the feedback we've received will allow us to make these Kickstarter Greatest Bags the greatest Greatest Bags yet. Sometimes Kickstarter projects do have delays, but we've minimized the variables, kept our reward tiers as straight forward as possible, and have fulfillment experience on numerous other projects. We hope to meet or beat our projected delivery schedule. There will no doubt be some twists and turns in the road ahead, but with your help, it'll be a GREAT journey. We love your spirit! You'll get a thank you email, including our exclusive Greatest Tournament Packing List, along with a high five when we see you! Stop dropping those discs! Get the #1 selling ultimate gloves in the world. They're basically Greatest Bags for your hands. Your lightning fast reflexes make you the envy of all the other, slower players out there. Enjoy your super early bird Greatest Ultimate Bag! You can't lead from the back of the pack. Get out in front and snag a limited early bird bag, captain! Never done a greatest in a game? Maybe after you get the Greatest Bag, you will. Mucho Value Pack! Get a great deal on this Greatest reward! Awww! Get double the sweetness and double the greatness - catch a Honey Pass! Team up and save! 7 players on the line, and 7 Greatest Bags on the sideline.